Since that date, NASA’s science experts found distant worlds, shared views from space probes that zoomed near Saturn and Jupiter, and launched satellites that help us better understand our home planet. And the number of Science WOW! subscribers multiplied to more than 7,000! This Week’s Question: How Many Moons Do Other Planets Have? Earth’s moon was in the spotlight during the total solar eclipse on Aug. 21. But what about other moons in our solar system? Do all planets have moons? Discover for yourself at https://solarsystem.nasa.gov/planets/solarsystem/sats. Did you miss the solar eclipse on Aug. 21? Or do you want to relive the experience of seeing totality? Check out the Solar Eclipse Gallery to see some of NASA’s best solar eclipse pictures. Two new NASA eClips™ resources have been released! NASA eClips™ are short, relevant educational video segments and lesson guides designed to inspire and engage students while helping them see real-world connections. In this activity, participants create a picture of the sun. The picture can then be examined with colored filters to simulate how specialized instruments enable scientists to capture images and view different features of the sun. Participants use the solar picture to model the difference between a partial and total solar eclipse. For 40 years, NASA’s twin Voyager spacecraft have been on an incredible journey that has taken them to the outer planets and beyond. Join Alan Cummings, a senior research scientist and Voyager team member since 1973, as he revisits the highlights of the last 40 years and speculates on what lies ahead for the intrepid Voyagers. **NEW** Solar Eclipse 2017: So It Rained — What Did You Miss? **NEW** Exploring Beyond the Planets: Do You Think Aliens Exist? Something new is always going on at NASA Space Place. Do you want to keep up with all the latest articles, activities and games? Sign up to receive the NASA Space Place Gazette! This monthly e-newsletter for educators and parents has information on all of the latest and greatest offerings from the NASA Space Place website. To sign up, visit https://spaceplace.nasa.gov/subscribe/en/. Please direct questions about the NASA Space Place Gazette to info@spaceplace.nasa.gov. This Week’s Question: What Is a Solar Eclipse? A solar eclipse happens when — at just the right moment — the moon passes between the sun and Earth. Watch this video and download the poster from NASA Space Place to learn the science behind the big Aug. 21 event! The newest Teachable Moment From JPL Education is full of resources to help get your students excited about science with the Aug. 21 total solar eclipse. Get background information, viewing tips, lesson plans and more! Only FIVE DAYS Until the Total Solar Eclipse! 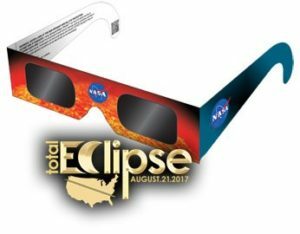 When viewing the solar eclipse on Aug. 21, NASA wants you to remember … Safety First! Looking at the sun with the naked eye is unsafe. But with special solar filters, such as eclipse glasses or a handheld solar viewer, you can safely look directly at the sun. Learn how to check the safety authenticity of viewing glasses, or find out how to observe the eclipse with alternate methods. For tips to view the solar eclipse safely, visit https://eclipse2017.nasa.gov/safety. To learn more and watch the videos, visit http://www.lpi.usra.edu/education/explore/eclipse/. Please direct questions about these resources to Christine Shupla at shupla@lpi.usra.edu. This Week’s Question: What Are Hurricanes? Hurricanes are large, swirling storms that form over warm waters in the ocean. Learn more about them in these stories written for students. As hurricane season approaches, NASA researchers are finding new ways to study these large, powerful storms. By combining multiple satellite observations, scientists are creating “A New Multidimensional View of a Hurricane” to study the complex atmospheric interactions that happen inside the storms. Watch this video to learn more. Less Than THREE WEEKS Until the Total Solar Eclipse! Do you have plans for observing the eclipse on Aug. 21, 2017? Eclipse events are scheduled all across the country. To find one near you, check out these maps of local events. Join NASA’s Digital Learning Network for an online Solar Eclipse Workshop on Aug. 8, 2017, at 3 p.m. EDT. This hourlong live-streamed educator workshop will showcase solar eclipse education resources for K-12 educators. Learn how NASA education resources can help you bring the excitement and science of the total eclipse of Aug. 21, 2017, to your classroom. Several hands-on activities will be demonstrated during the workshop, and subject matter experts will explain why the eclipse is a unique event for scientists and the public. For more information, visit https://www.facebook.com/events/368018193617114.